We are two Bell Canada mobile gurus that do mobile applications for Bell Digital Solution a group of professional services that deliver mobile and web solutions for our clients. 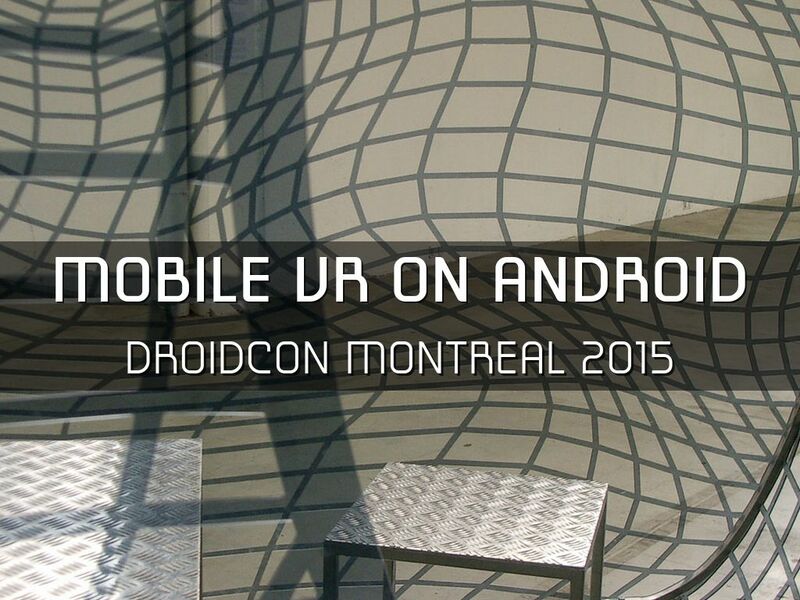 We are also passionate about new trends and today we will discuss about mobile VR! 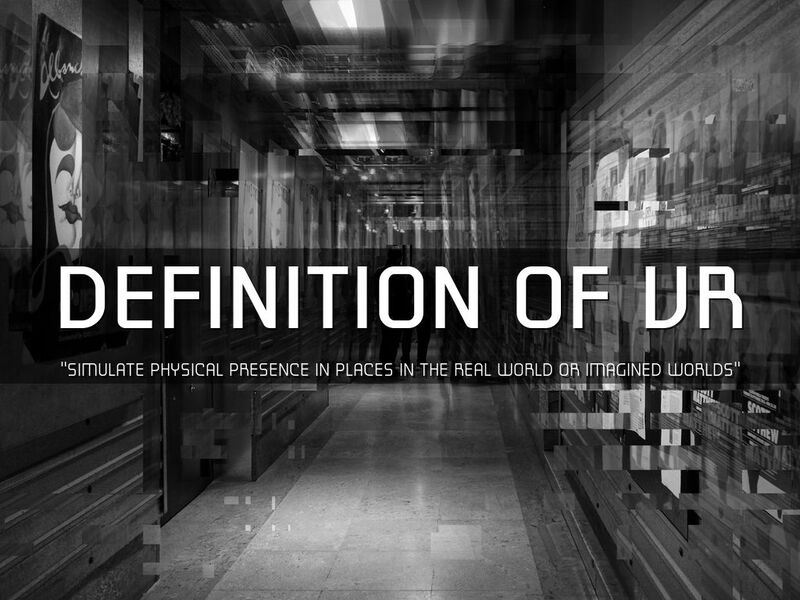 "simulate physical presence in places in the real world or imagined worlds"
What is VR? 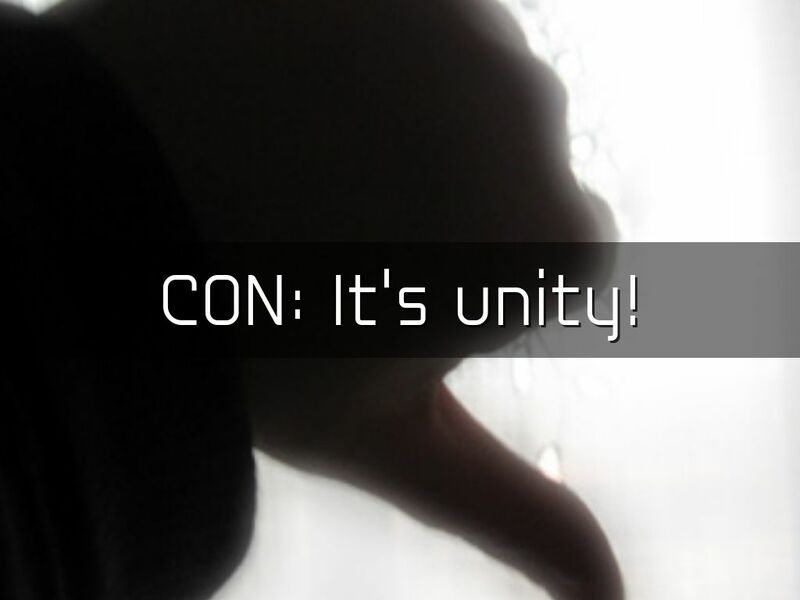 Well this sentence sumarize quite well the actual concensus. 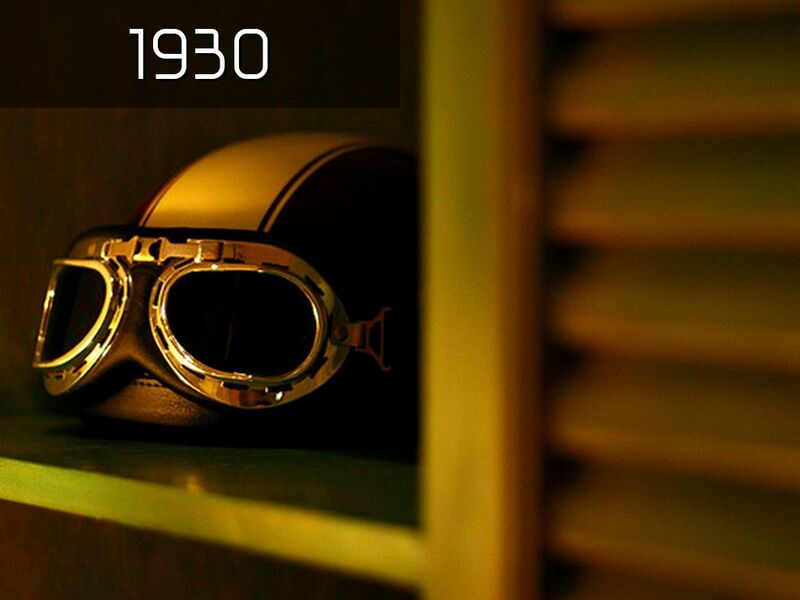 review quickly review the evolution of VR. Since LED screen was not yet available he used the next best thing "Paint"
Sensorama was a real immersive experience to emulate a bike ride in brooklin. It was able to display stereoscopic 3-D images in a wide-angle view, provide body tilting, supply stereo sound, and also had tracks for wind and aromas to be triggered during the film. 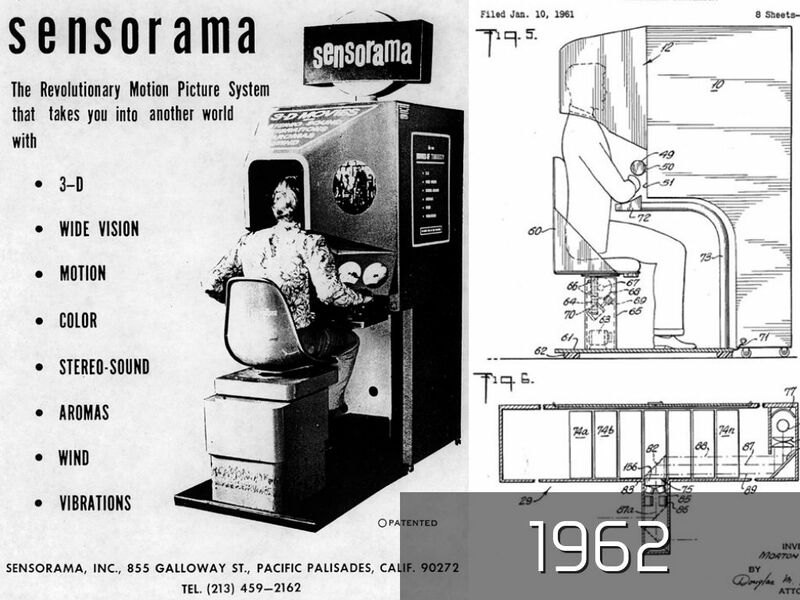 Oddly enough in hindsight, Heilig was unable to obtain financial backing for his visions and patents, and so the Sensorama work was halted. 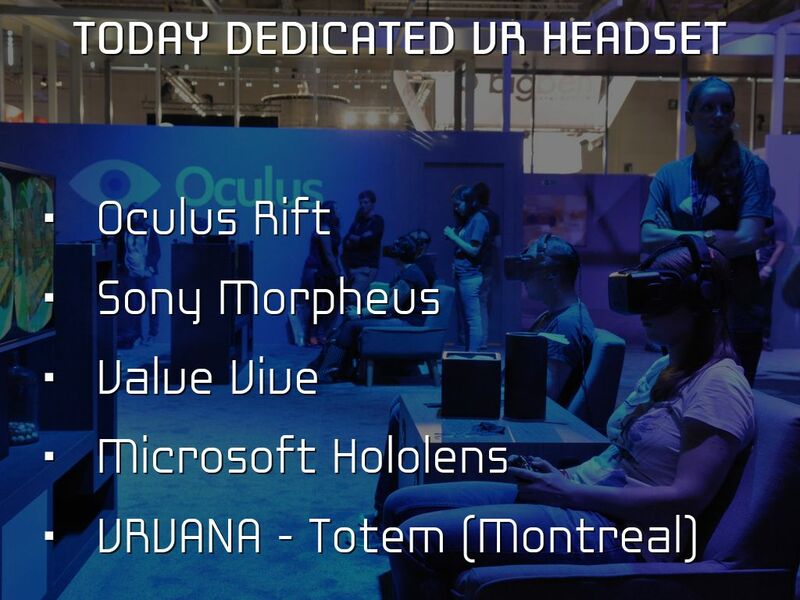 Today, it remains primarily a curiosity in the history of Virtual Reality. 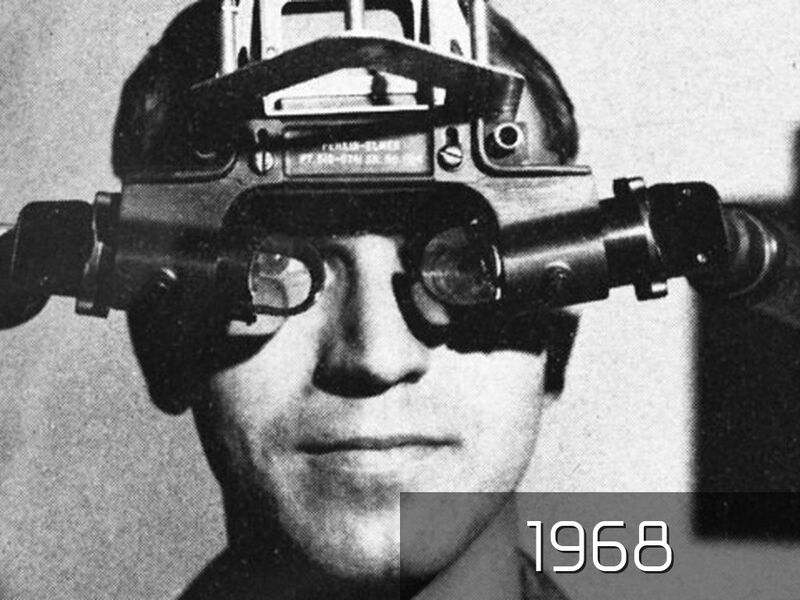 1968 Ivan Sutherland, Create the first Augmented Reality devices for the USAF. It was displaying augmented reality, putting digital wireframes over actual room. Yet this prototype was laying fondation of actual F35 helmet and modern HUD. 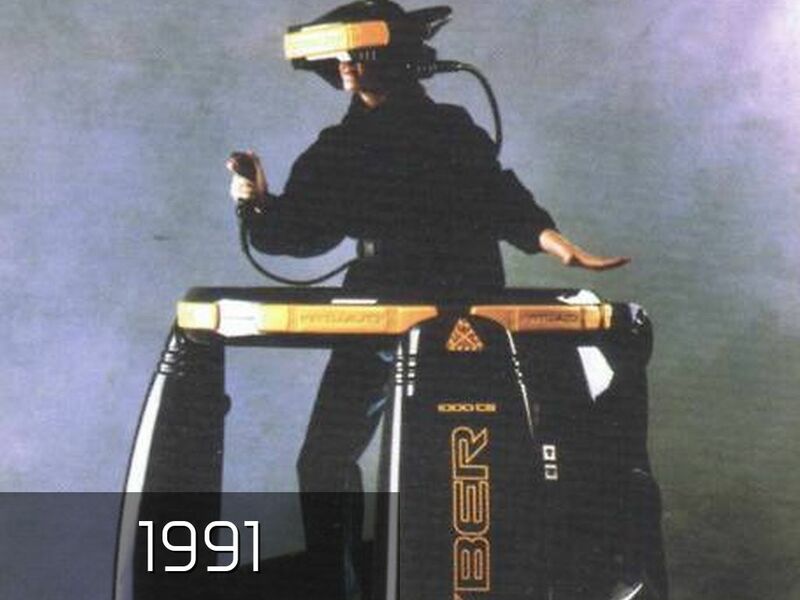 The same year, a arcade rig called Virtuality hit the market, with a price tag of 73k$US this was clearly not aimed to be mass produced. 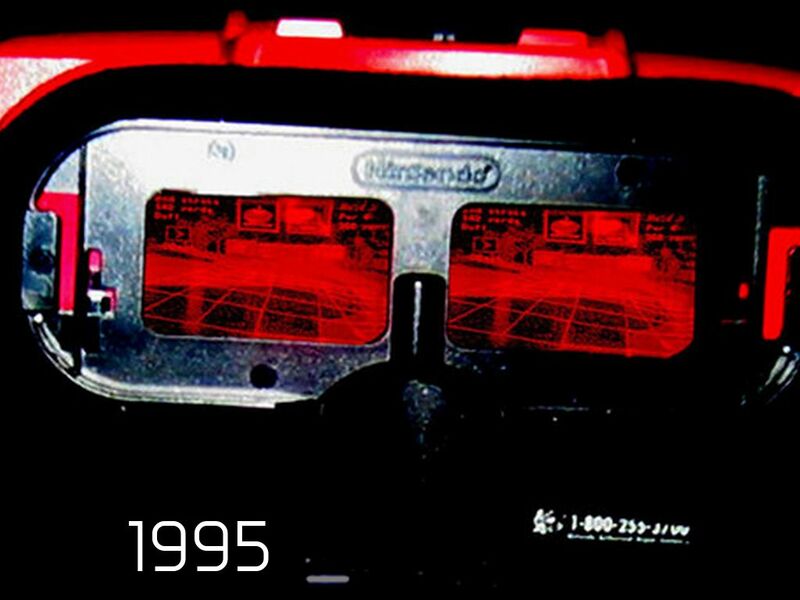 First consumer grade VR-ish device, Nintendo sadly wasn't able to seduce the masses. In order to reduce price to the maximum monochrome LED was used and yet it was still pretty expensive for the experience it offered. We needed to wait near 20 years to see practical new solution appear on the market. 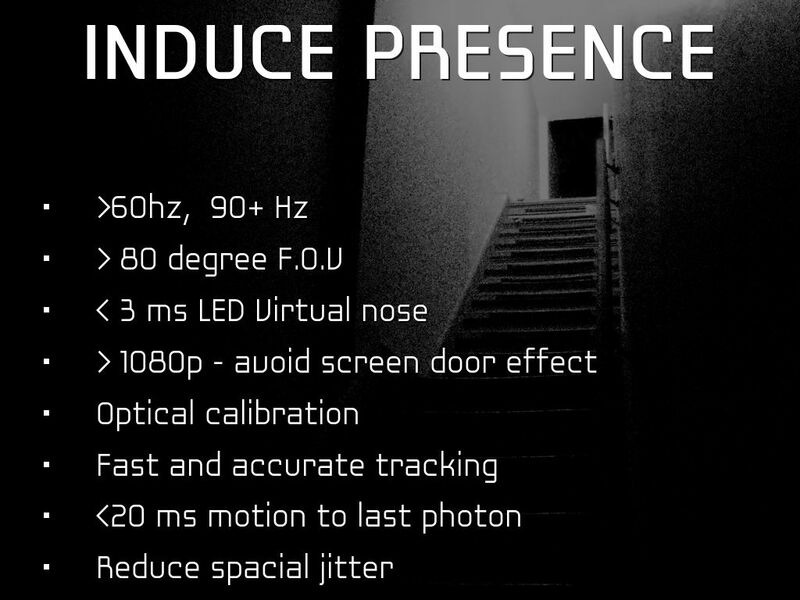 - Oculus Rift, probably the most well know device, use accelerometers and IR Camera to track devices in space. Very clever IR LED flashing allow the camera to estimate the exact position of the helmet in space. - Valve Vive with fraking lasers seems very promising ! 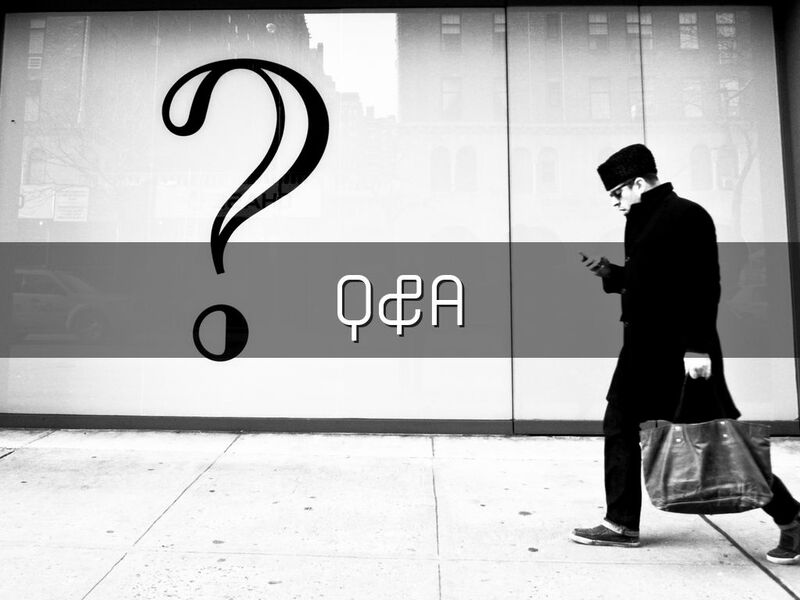 2014 was clearly a new wave of new devices, lets review what is the current market state in term of these devices. To be used hand held, more or less unusable with head straps without a lot of modifications and padding. Try not to turn it into an HMD. There are some advantages of using lenses with larger diameter and better build quality, but the differences between the different Cardboard versions are minor, so the cheapest one will usually do unless you tend to spend a lot of time with it. 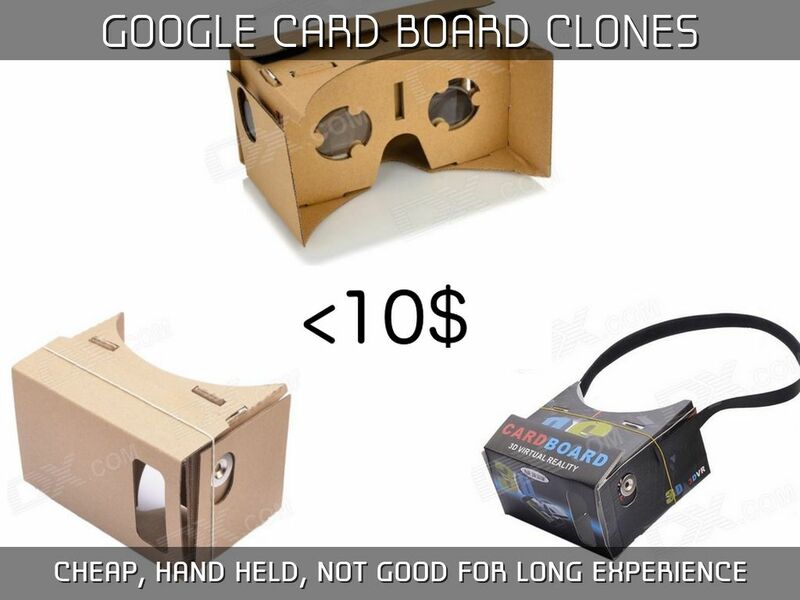 Group includes Cardboard clones made of other materials, some featuring head straps without padding. Mostly unusable for VR unless you alter the lenses and the case. 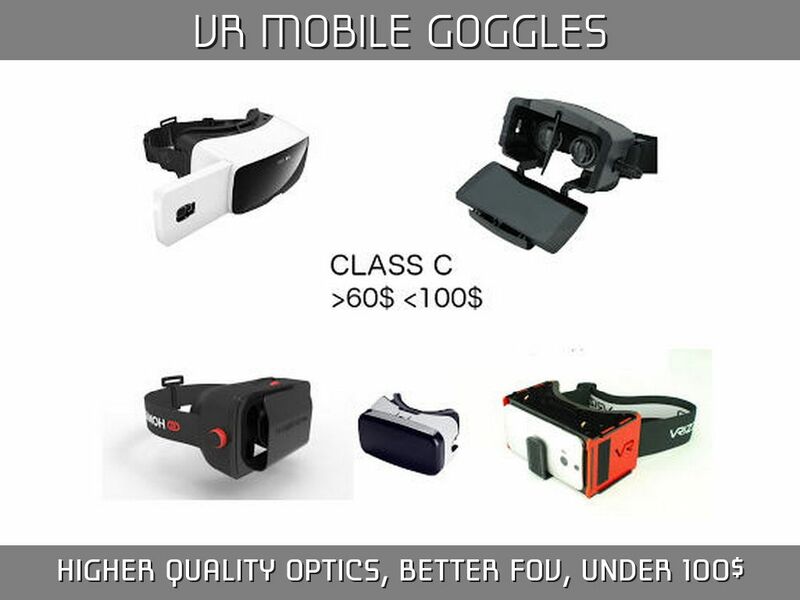 Several (ColorCross , Ritech 3D , Storm I , Storm II , Xiaozhai , UnicornVR ) can be bought cheaply, most of them are reasonable comfortable and they have features like adjustable lens-lens and lens-screen distance, especially useful with very small or very large screens. Unfortunately they are intended for 3D movie watching first and all have a horrible FoV even with larger screens, which breaks immersion. I've been tinkering a lot with Cardboard and plastic 3D goggle modifications with single and stacked lens configurations, and while I can get a rather impressive FoV out of these for under USD 25 total, it is a lot of work and you won't get near the image of high quality lenses matched to a specific screen. Technically very similar to group B, but actually intended for VR. This primarily means the lenses have magnification similar to Cardboard, are of (slightly) better quality and the phone is held closer to the lenses. These (Durovis Dive , Zeiss VR ONE , Homido , XG HMD , VRizzmo ) are not mass produced in China, some of them come from Kickstarter campaigns with small production runs, so they cost significantly more. 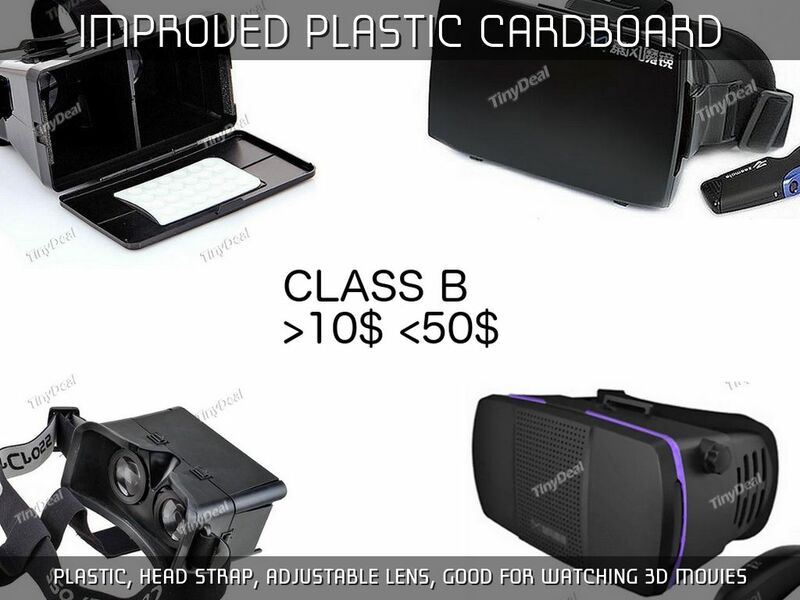 If you need an HMD with headstraps, proper lenses and large FoV without having to mostly build it yourself, these are what you can currently get, but you still get pretty much the same VR experience as with a cheap Cardboard. This may be worth it if you are streaming a lot of games from a PC, but there aren't many sufficiently long VR experiences that would require something like this, most apps now target the handheld Cardboard. The best may be the Zeiss VR ONE due to optics, trays to align the phone and their SDK that optimizes for this, but it only works with a few phones and I don't know any apps that actually use the SDK. 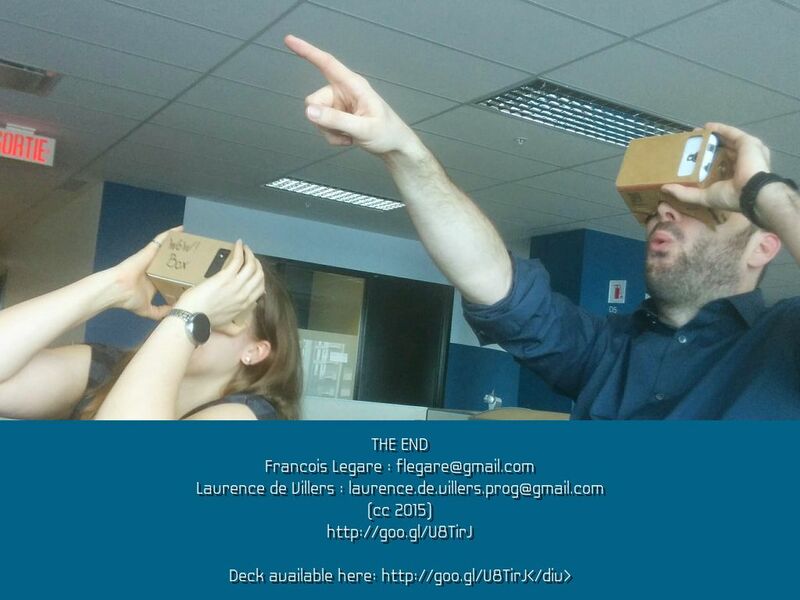 Best VR Experience so far for mobile, its the mobile alternative of the oculus. 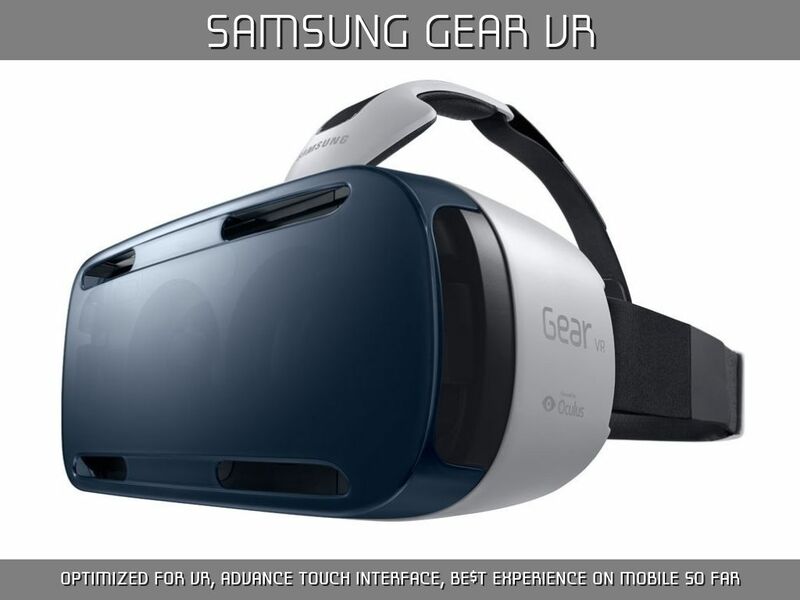 But at 200$ for the case, and 799$ for the Note 4 (299 with a 2 yrs contract at Bell wink wink) ... not the cheapest VR option but clearly the best VR exp. on mobile so far. The better the quality of the device the better will be the illusion of immersion. 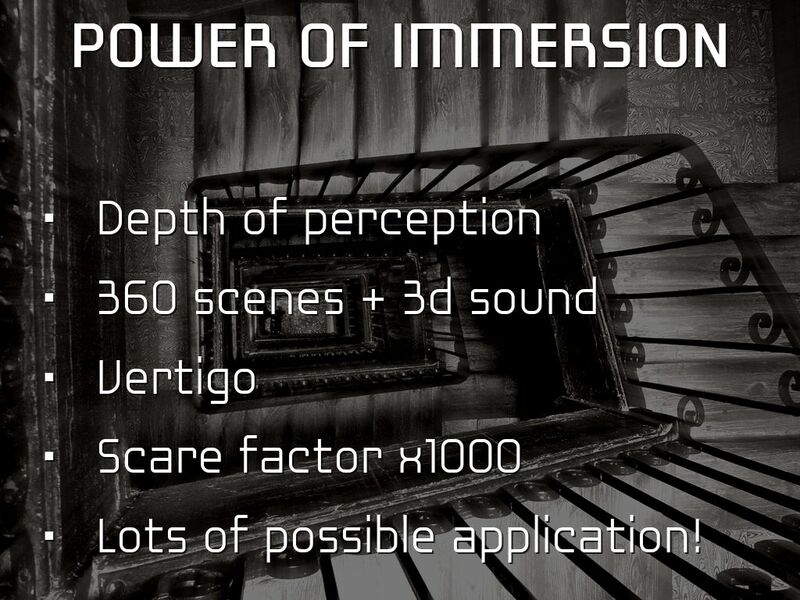 There is a lot of power associated with this immersion, just think of the possibility for a second. VR bring a new subset of experience to the software piece. Of course games is one of the first obvious application for VR but think for a second all the opportunity that VR bring to the table. 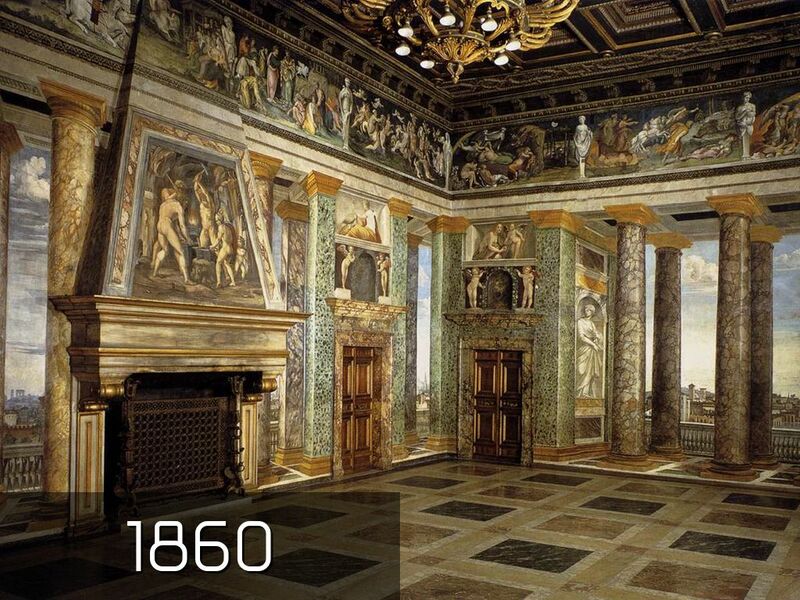 Architecture, feel a room prior constructing it. Retail, walk in a virtual store. Even Bjork is about to release a music clip VR friendly, I presume the CD will be based on a cardboard ! We see lots of possible application but there is still lots of challenges. 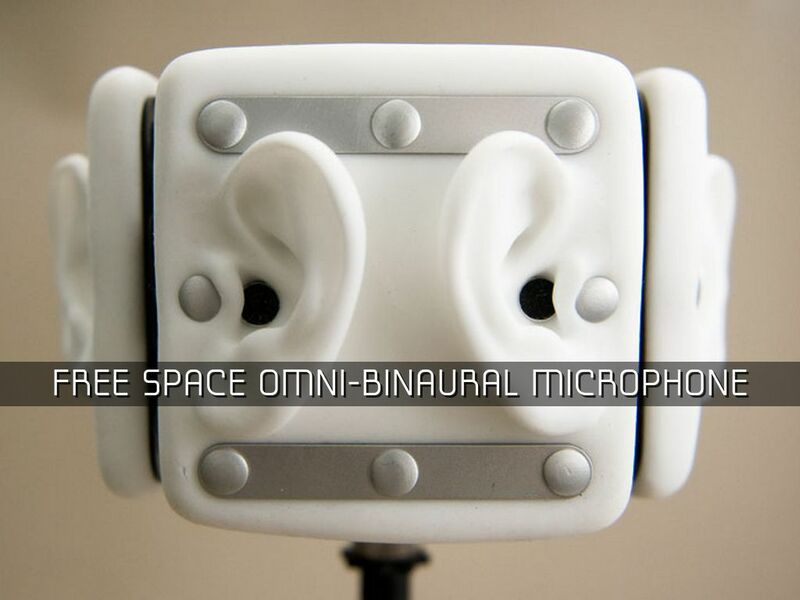 One of the biggest is making VR accessible to humans! 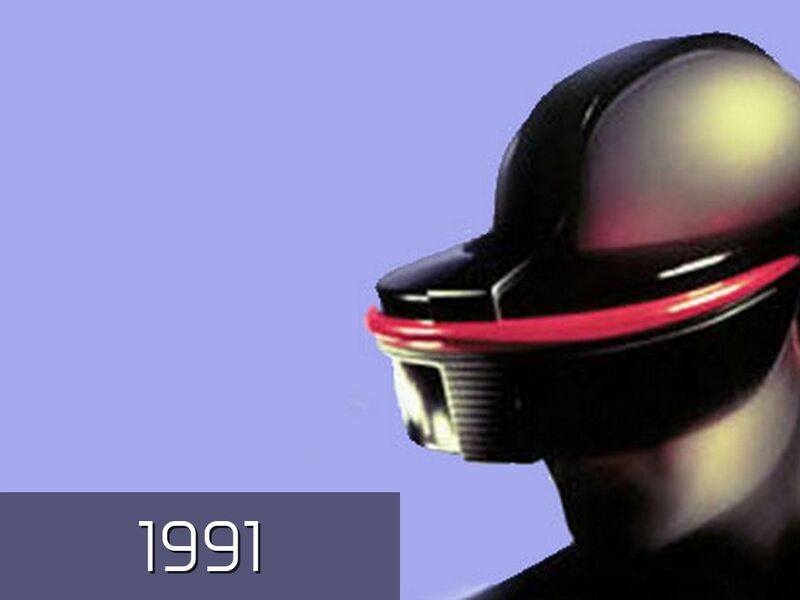 - User inputs: when we have the helmet on the eye, we can hardly interact with the real environment. Most practical way so far is bluetooth controllers or the clever magnet on the cardboard. Samsung Gear come with it's own touchpad. 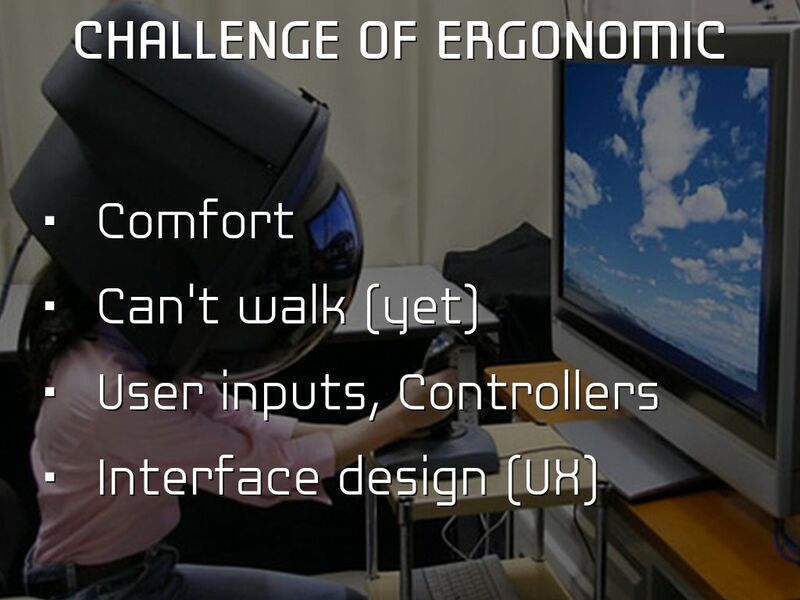 - UX for VR need to be rethink with these new challenges. Current trend is to put a visor at center focal point that will act as a selector if left over a actionable item long enough. To get a really good presence feeling we need to design our software to meet or be close of these specification. How we reach this ? 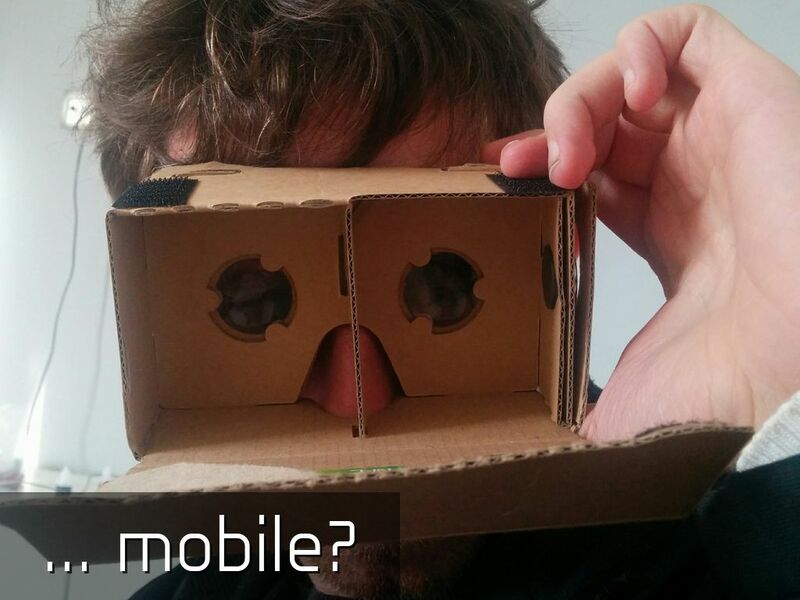 Be designing more specifically for Mobile VR and not parsing regular VR app to mobile. 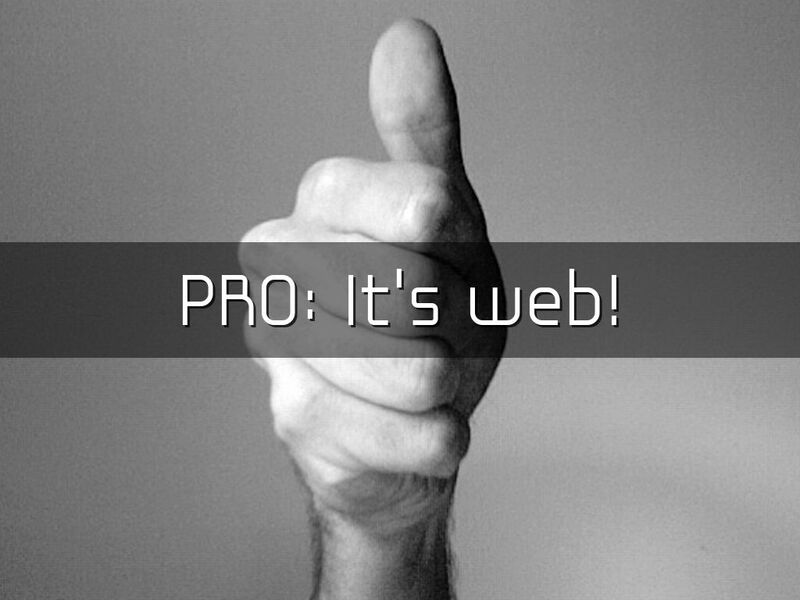 A bit like web experience, we dont take a regular website and try to fit this in mobile phone. For an simple example, if you allow the user to use head motion but don't allow the visual to follow the real motion movement, it can get confusing for the mind and can create motion sickness. 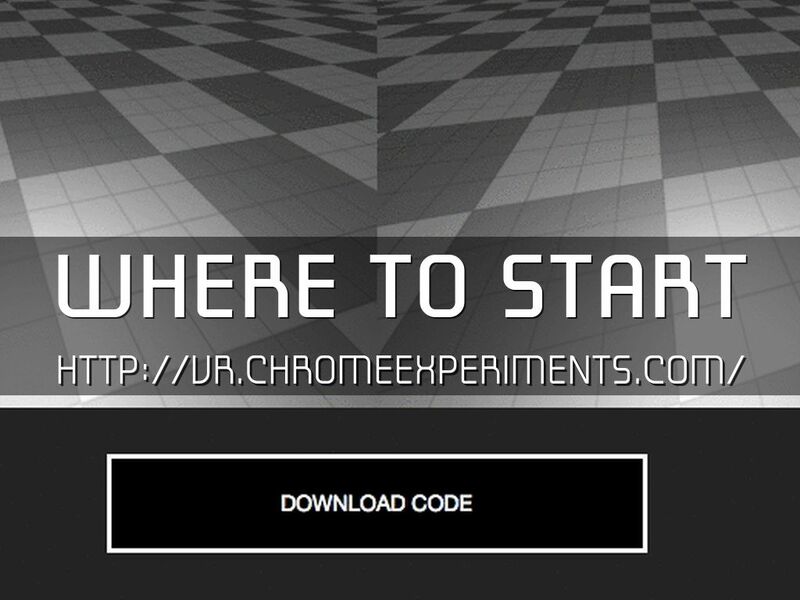 If you want to see what is the feeling try VR scene application. These tricks was mainly for 3D rendered scene, now let's see how you can capture our world to put in your own experience withtout making a 3D scene from scratch. Usually this is mostly done using a 3D scene with a skybox or spherebox and the magic happend. 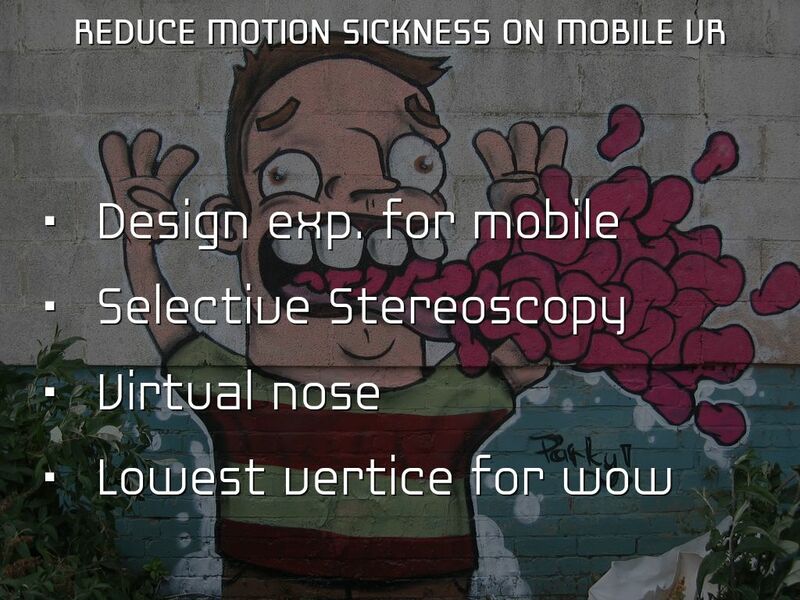 This is the theory in practice making this possible with high FPS on most of the phone can be a bit challenging. 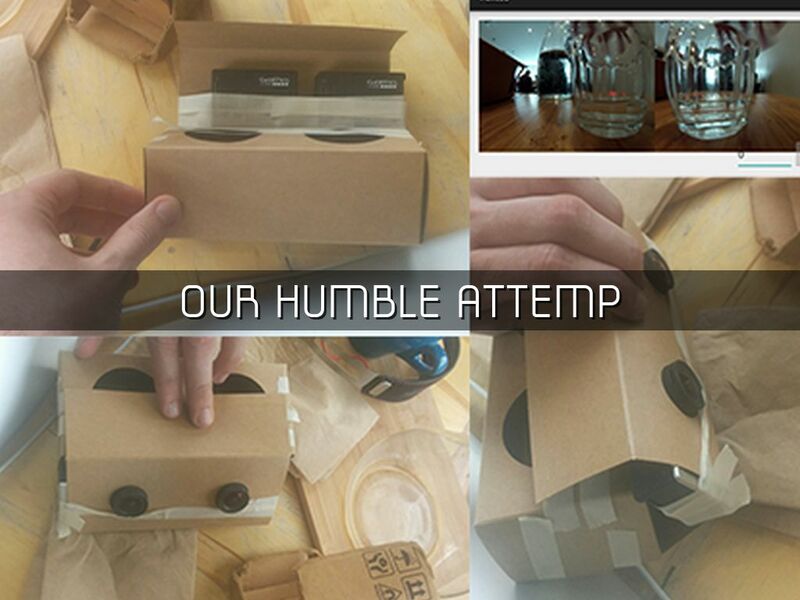 This 3D cardboard camera was done using 2x gopro, some scotch tape and a lot of naivety. Synch the two footage. Let's say this was also a time waster, pro tip make a lound bang when you start your footage and try to synch with this. First challenge, space between eyes. We didn't bother too much about the Interpupillary distance. The space between the two camera. The result was a major see sickness when we played back the video. So make sure if you put the camera distance around 60 mm ishhh distance. 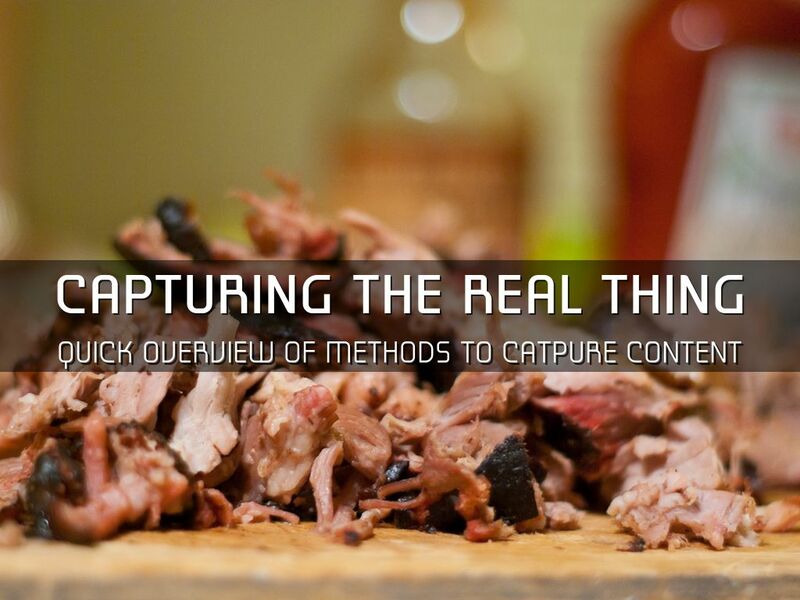 If you are really serious about capturing content buy the real stuff you will save a lot of time. 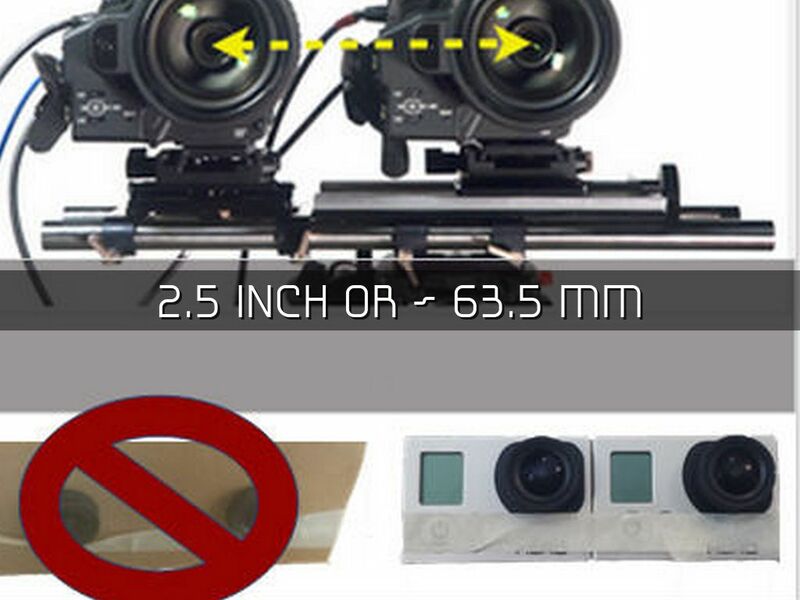 For 3D footage, Hero360 and GoPro have special case that allow capturing 3D and even 360 3D footage. It require the advance gopro for synchronisation. 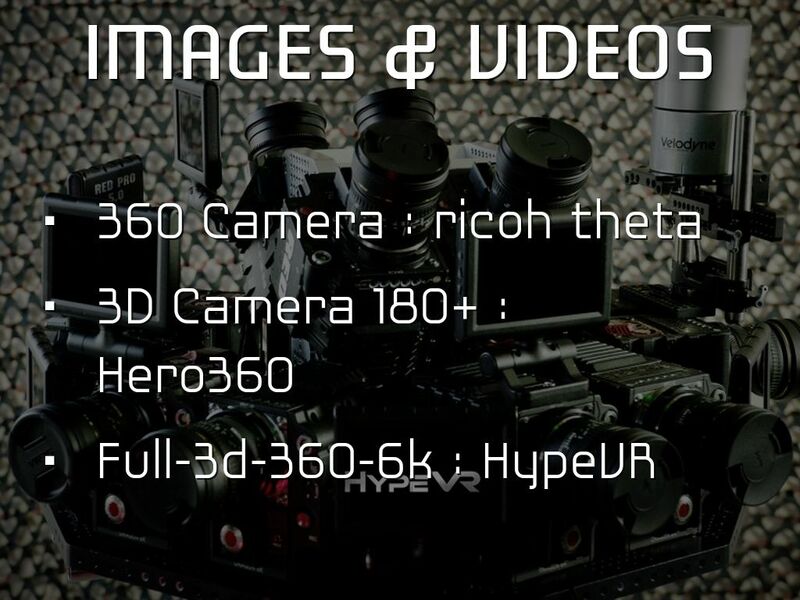 For unlimited budget, the HypeVR is pretty much the top of the line. Price tag must be around like a Villa near a beach. 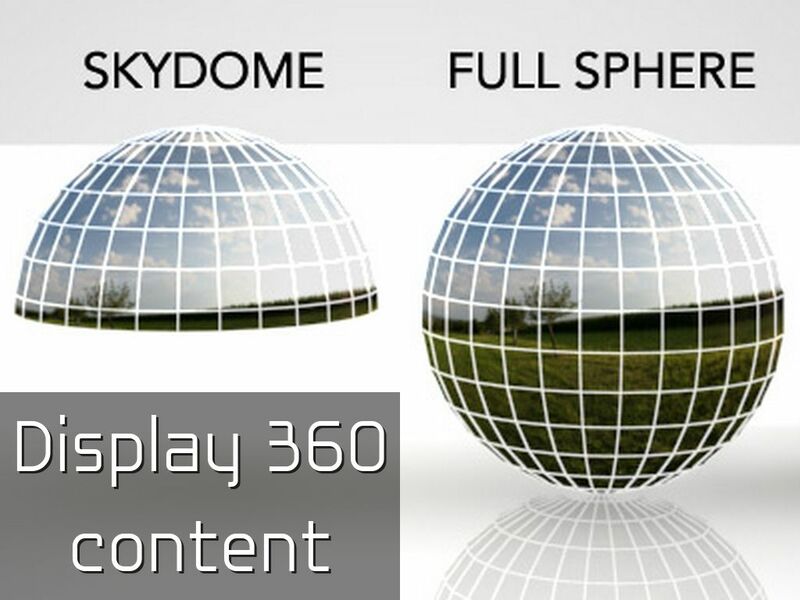 For none 3D 360 pictures, the easiest way to simply map the picture to a cube or a sphere and render the scene in the middle of it. This off course require to adapt the picture to fit the mapping selected. 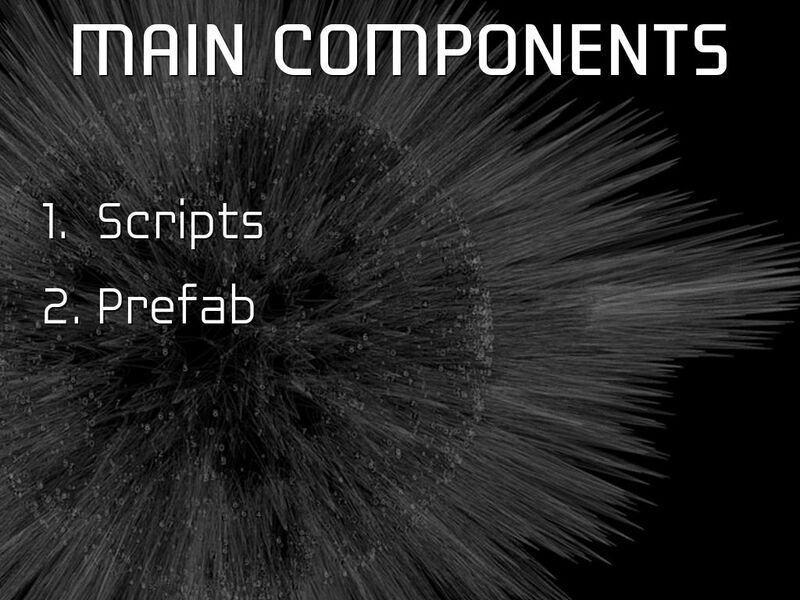 There is a couple of panorama formats existing, in the next slides we will see project that attempt to reproduce the full cube and sphere using the SDKs. Ok now you that you have your content how do we actually build the app??? 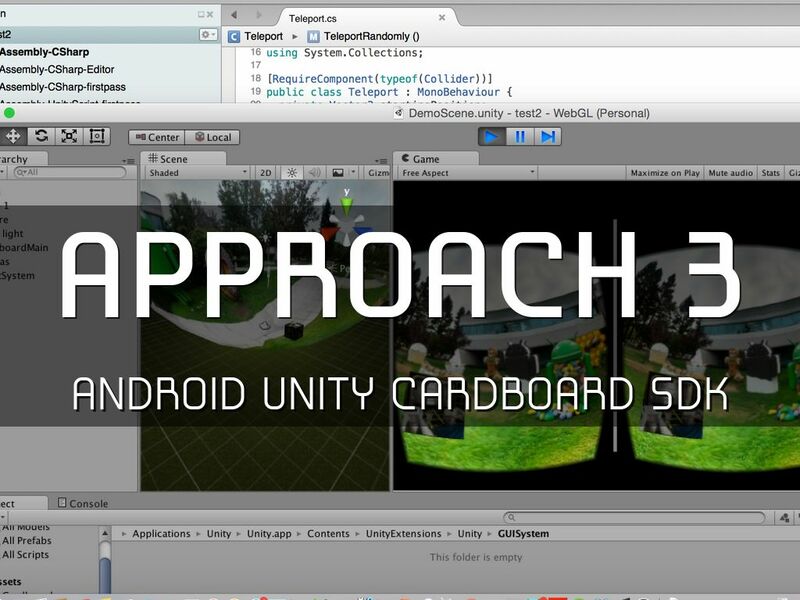 Well the first approach is probably the easiest one if you are new to the 3D programming world. 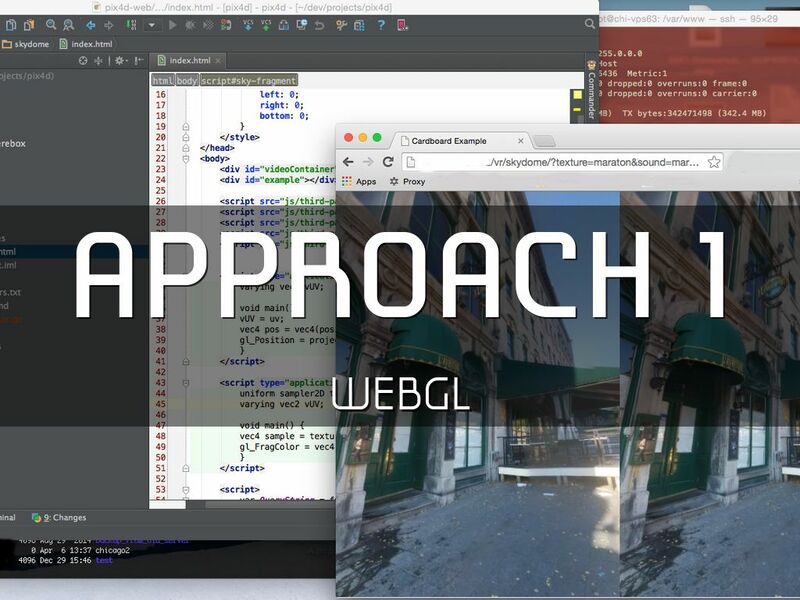 It use WEBGL for rendering the scene. 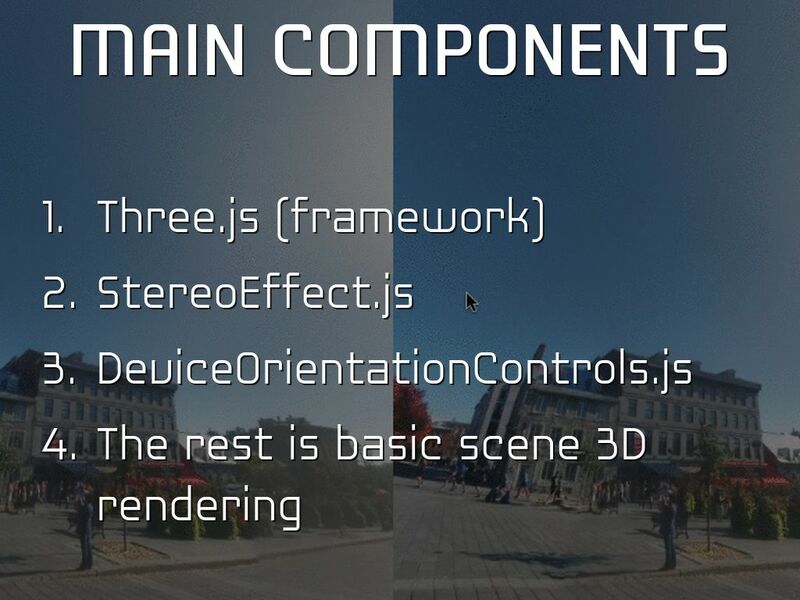 Plain html can do VR. Head to this URL, you will find a couple of sample experience. At Wear hack montreal we where able to make a photosphere viewer web based in under couple hours. 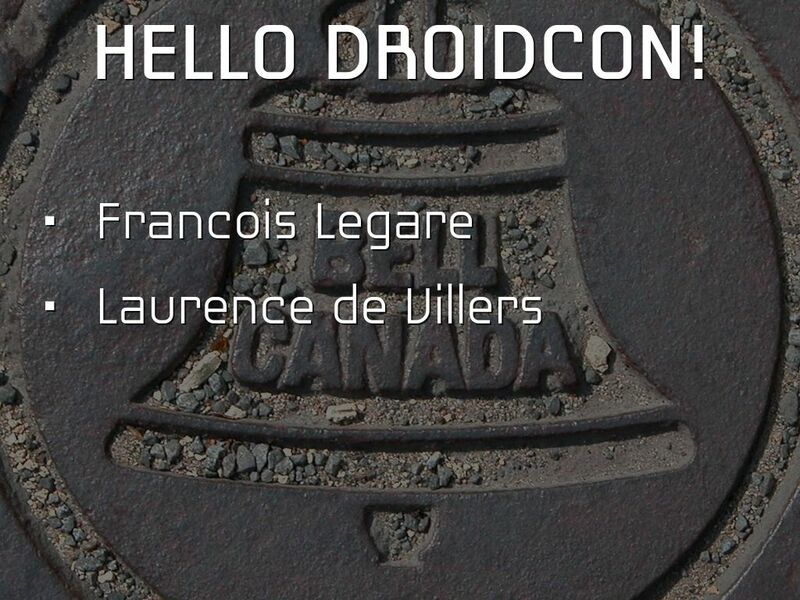 - Multiplatform but I wont mention iOS at Droidcon wouldn't I? - Long download time prior anything move, need to build custom loader if you want a good user experience. - Performance is limited (at the moment) - FPS hit vs dedicated approach in openGL. This should be kept for simple stuff. onCardboardTrigger () that detect magnet "click"
Convenience extension of GLSurfaceView that can be used for VR rendering. Designed to work in full screen mode with a landscape or reverse landscape orientation. 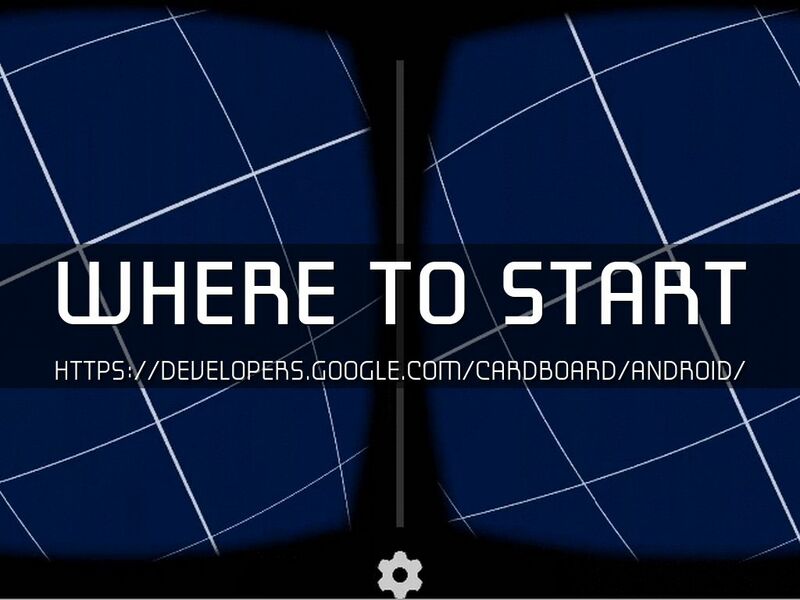 CardboardView.StereoRenderer: abstracts all stereoscopic rendering details from the renderer. The view allows switching from VR mode to normal rendering mode in stereo renderers at any time by calling the setVRModeEnabled method. - User input event handling. 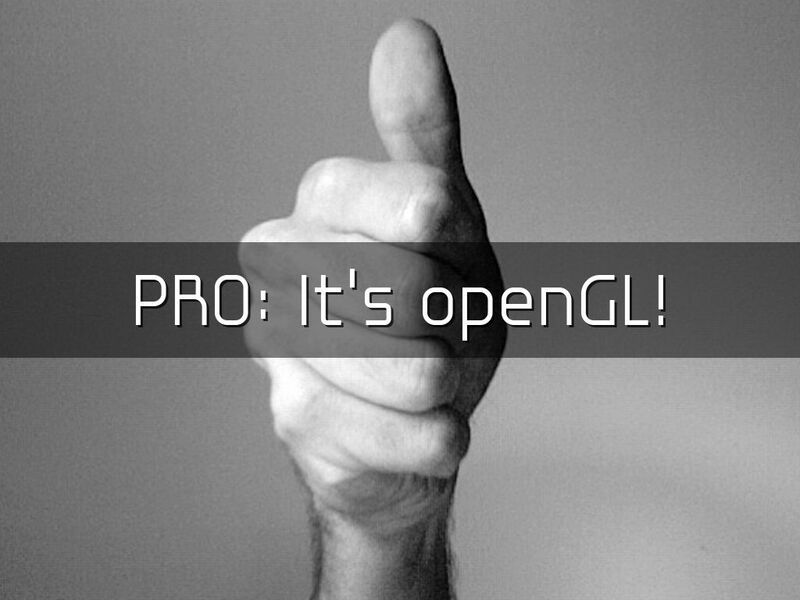 - Unless you have good experience in OpenGL or plan to invest sometime in learning openGL it's a bit tedious to grasp all the concept initially. This prefab contains a full stereo rig, with a camera tagged MainCamera, and an instance of the Cardboard script for controlling VR Mode. CardboardHead under the main Camera, so that only the stereo cameras are affected by user head motion. Then, finish the rig by executing the Update Stereo Cameras command, which adds the StereoController to the Camera itself. No need to tackle on OpenGL matrix, the tool make this for you. You only have to build your scene and apply the required game logic. 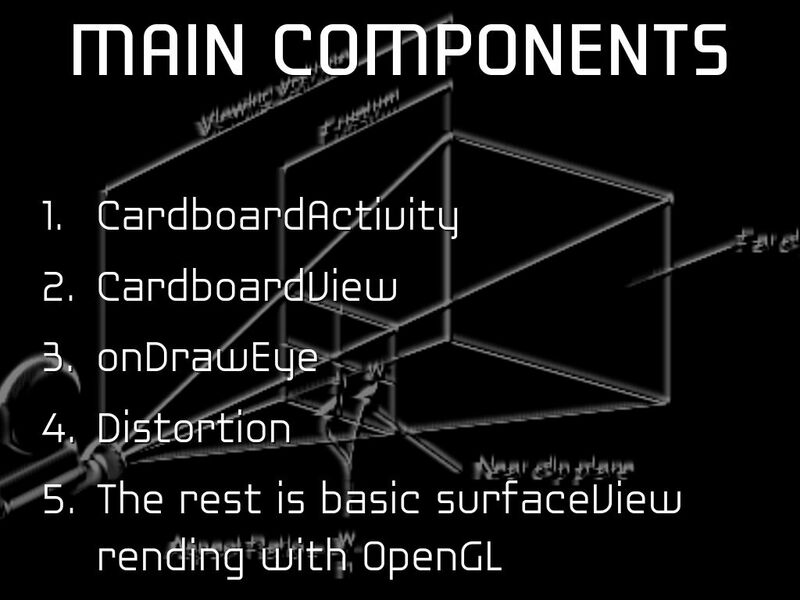 CardboardView.Renderer: for complex engines that need to handle all stereo rendering details by themselves. 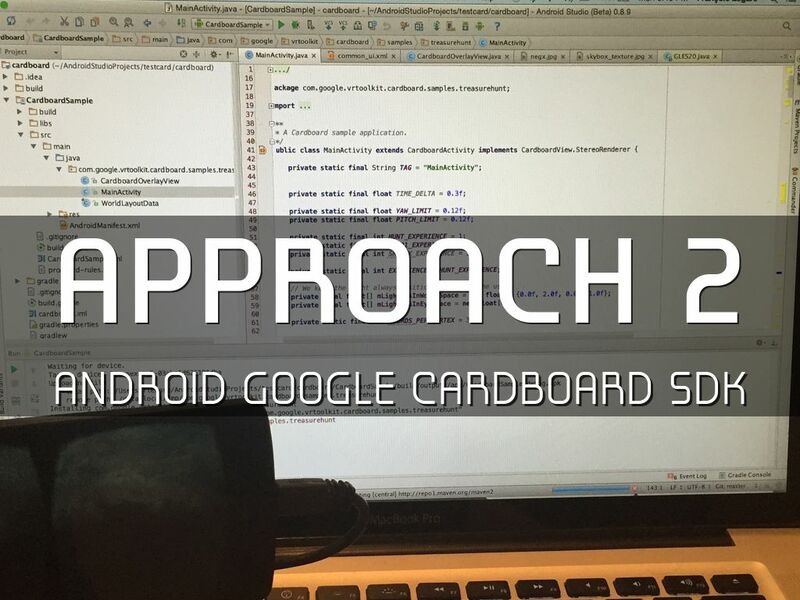 The CardboardView.StereoRenderer interface is recommended for all applications that can make use of it, while the CardboardView.Renderer interface is discouraged and should only be used if really needed.